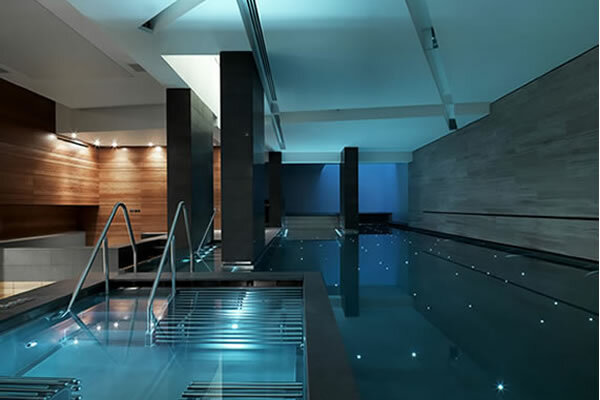 Beautiful, bespoke indoor basement stainless steel swimming pool and spa with PLC controlled high specification filtration plant in London. 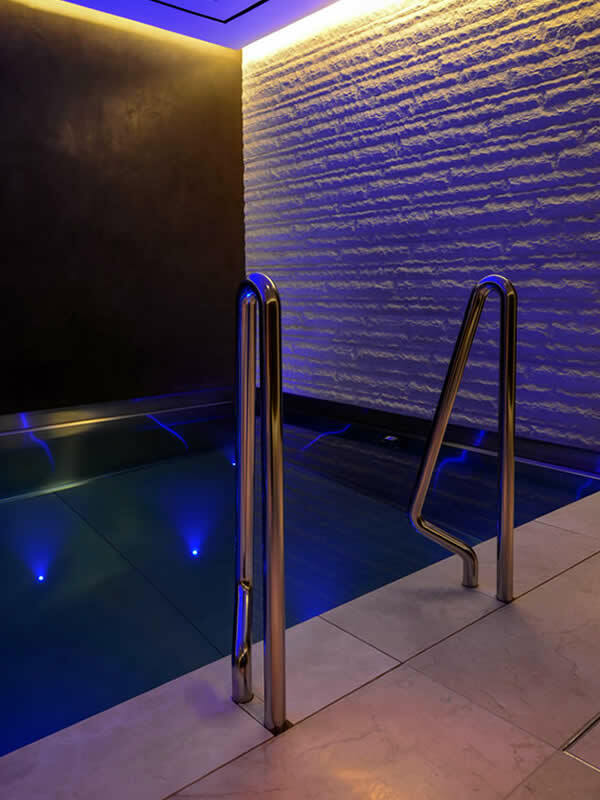 A basement stainless steel swimming pool/spa, including steam room & sauna, built within the basement of a Central London private residence. A challenging installation adhering to a high end consultant specification, which included a commercial chemical dosing unit, medium pressure UV, deep bed filters. The swimming pool benefits from high quality Wibre LED colour changing lights and underwater speakers as well as an automated slatted cover. The transformation of a tired indoor swimming pool desperately in need of help and rejuvenation. See the photo's to show just what can be done - stunning. Refurbishment of an existing 12m outdoor swimming pool in the Chilterns including complete tile replacement. Click on the link for more details. 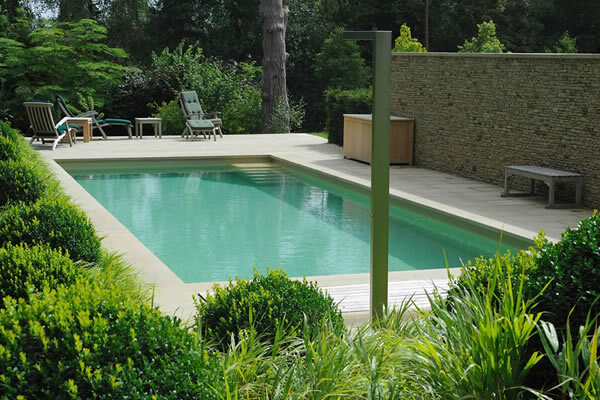 Pools by Design were tasked with refurbishing the swimming pool to provide a beautiful, safe and reliable installation. 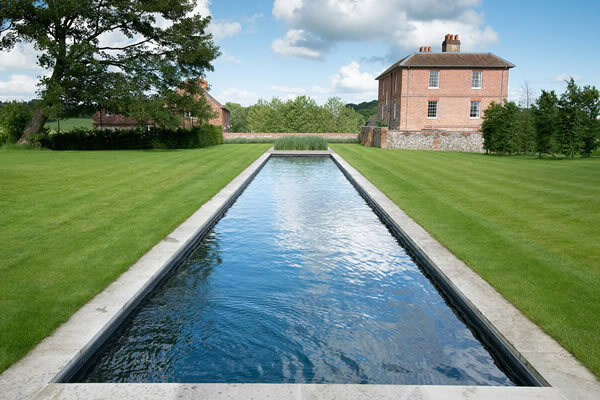 Outdoor freeboard swimming pool in Surrey designed in conjunction with the renowned landscape designer Andy Sturgeon to sit comfortably within the garden scheme. 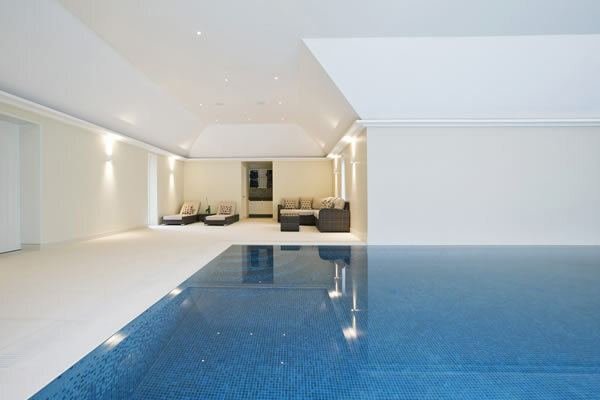 The pool benefits from Bisazza mosaic finishes and York stone surround and a feature Horsham stone wall provides privacy. 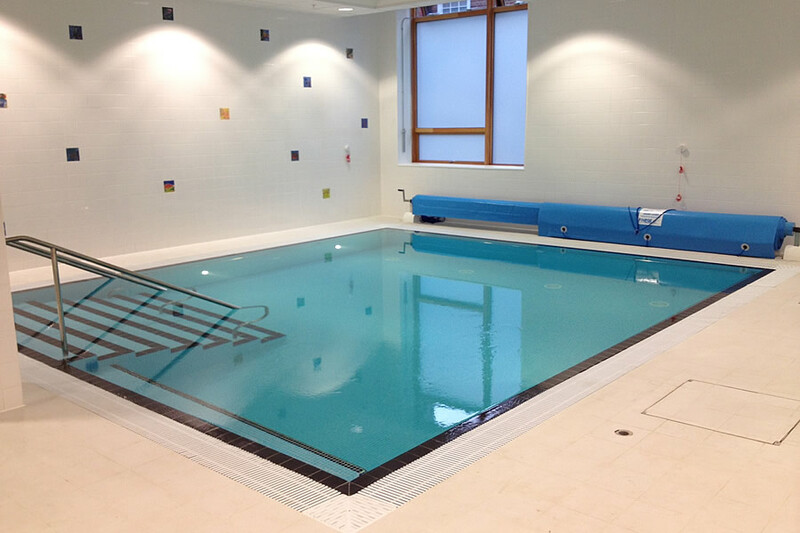 The pool is served by a high specification filtration plant including medium pressure UV sterilisation, automatic chemical dosing and air source heat pump. 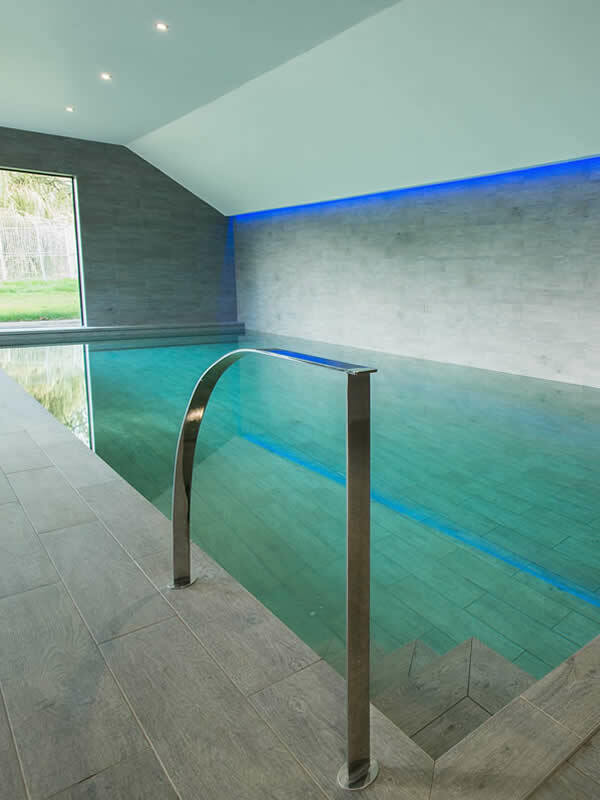 Refurbishment of an existing swimming pool and spa, including the re-tiling of the spa and pool steps plus the addition of a new bespoke mural cut into the existing pool floor. Stainless steel features were added including side grab rails and a bespoke ladder. The air handling system had a complete overhaul of ductwork with colour coded grilles being added in order to blend into the new pool hall decoration. 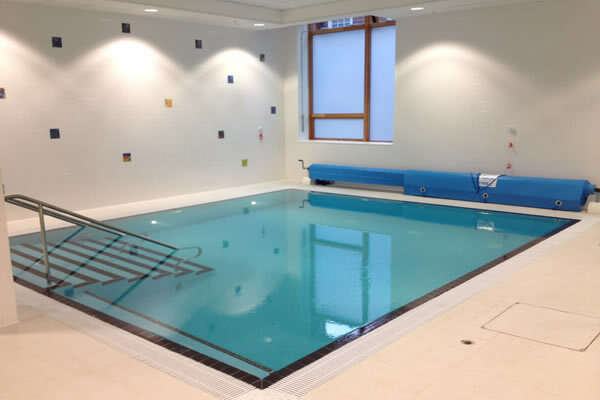 An installation of a hydrotherapy pool at the Swiss Cottage Specialist SEN school, we installed a range of audio visual interactive equipment, along with an extremely high specification filtration plant, and air handling system. In London. 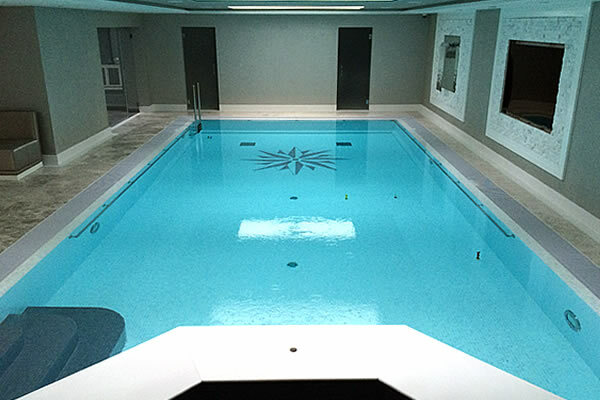 Stunning new basement swimming pool with mirror finish mosaic and client logo inserted on the pool floor, pool benefits from a spa bench with massage jets and an automatic slatted cover. In London. 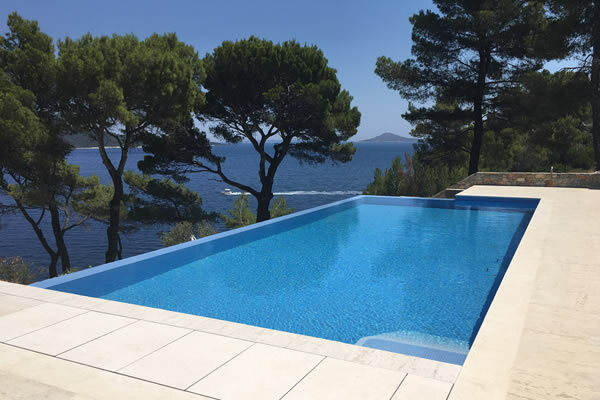 Stunning Infinity swimming pool on a Greek island with automatic slatted cover and Trend mosaic. 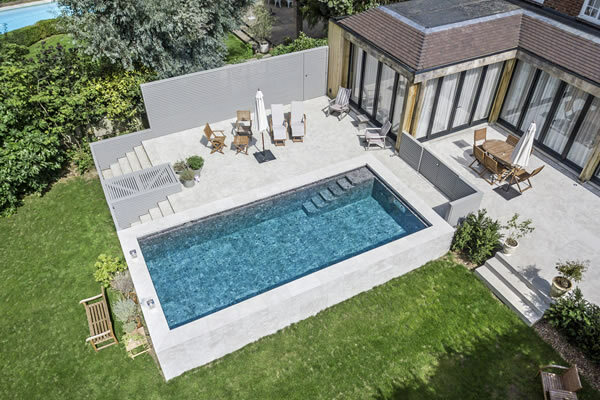 A compact new outdoor training pool installation was completed in conjunction with the clients team who were overseeing a complete overhaul of the house and garden. 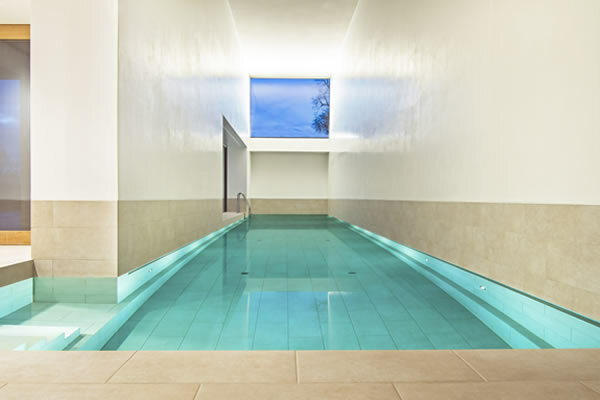 The small level depth pool is designed to make the most of the entertaining space and garden and benefits from large format porcelain finishes, stainless steel fittings, an automatic slatted solar cover and a Jetstream counter current swimming machine built into the end wall. 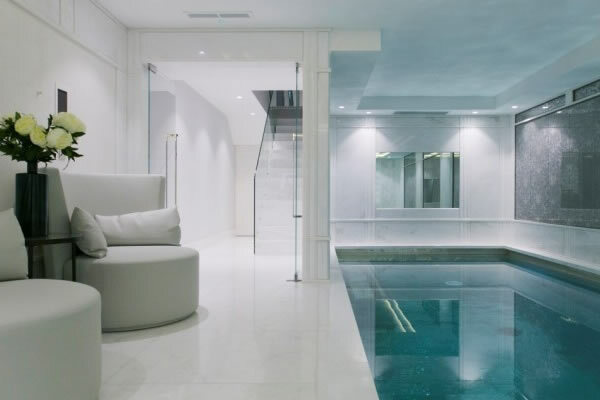 Pools by Designs is a swimming pool consultancy with 25 years knowledge and experience in the design, installation & construction of high specification swimming pools in London and across the South East of England. Our head office is located in Cranleigh, Surrey and we are contactable Monday to Friday during normal working hours. Outside of these hours please use our email address. We will attempt to repond to all enquiries within 48 hours. Thank you.